Our Grade 9 Fine Arts class started the new school year with a few drawing assignments. The students then proceeded to their main studio project which was painting with acrylics on stretched canvas. While researching the artist Georgia O’Keeffe, they tried different techniques while working on a close-up composition of a subject which interested them. Our students had fun choosing colour and learning how to blend, and they should be very pleased with their finished products! The paintings are being displayed in the entrance of our Fountain Performing Arts Centre for the next few weeks. We hope you enjoy our Grade 9 works of art! 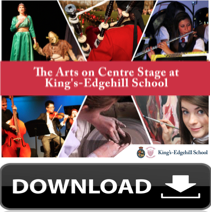 If you are a dancer, a singer, a musician, an actor, or an artist, King’s-Edgehill School is the place for you.